The pound’s performance against the euro can have a significant impact on trade, salaries, travel and the cost of living. Since 2014, the value of the pound against the euro has fluctuated between €1.44 and €1.08. In an expert analysis piece for The Detail, financial journalist Paul Gosling reviews the peaks and troughs of the pound. Between 23,000 and 30,000 people cross the Irish border daily to go to work, estimates the Centre for Cross Border Studies. The majority work in Northern Ireland and live in the Republic. Most pay their mortgage or rent and perhaps their food bills in euros – while earning in sterling. Brexit has been bad news for them. A few days before the UK referendum on the EU on 23 June, 2016 the pound bought €1.3156 on the markets (though less at a bank). 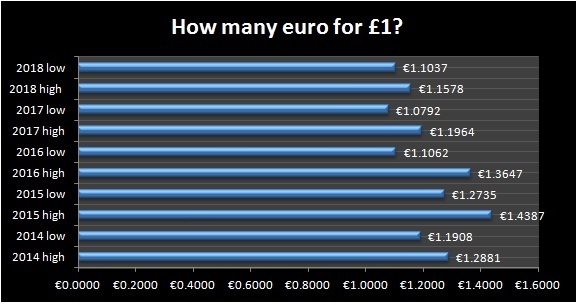 A few days later, at the beginning of July, that pound bought only €1.1718. This represented a fall in euro earning power for cross border workers of 10.93%. The weak sterling is causing problems for those living in the Republic but earning in Northern Ireland. One cross border worker – who asked not to be named – reported that the loss in value of the pound was hurting his family’s income as he has watched his take-home pay fall by hundreds of euros a month after he transfers it from sterling to euros. To show the impact of the strength/weakness of the pound on a cross border worker, The Detail reviewed historic currency exchanges between the end of May 2016 and October 2018. Between those dates, the value of the pound has fluctuated between €1.3123 and €1.0864 based on rates taken at the close of business, on the last working day of the month. For a cross border worker transferring £1,200 into euro they could get anything between €1,574 a month and €1,304 – a difference of €270 a month. Since a peak in May 2016, a cross border worker over that 29 month period has seen around €5,747 wiped off of their income because of fluctuations in the value of the pound. Brexit anxiety had already damaged the value of sterling against the euro, even before the referendum. Back in November 2015, a pound would buy €1.4271. That was at a time when the migrant crisis was damaging confidence in the EU and the eurozone. This reflects a core truth, that the value of sterling reflects not only the politics of Brexit, but also the strength of the UK economy and – in contrast – the state of EU politics and the strength of the eurozone economy. This is clearly illustrated by the pound’s value in July 2015 – at the depth of the Greek bail-out crisis – when a pound could buy €1.4410. Once the German Bundestag agreed a deal on Greece, the euro strengthened against the pound. This valuation was a sharp rise compared to the pound’s value a year before, in March 2014, when it was only €1.1952 – sterling jumped when the European Central Bank considered placing eurozone interest rates in negative territory. It was at the end of 2015 that the pound’s valuation began turning. In late November, anxieties about the impact on the EU from migrants were replaced by worries over the possibility of a ‘yes’ vote in the following year’s UK EU referendum. The fall coincided with a warning from Moody’s credit ratings agency that the UK’s credit status could be damaged by EU withdrawal. The slide continued as speculation grew about the date of the referendum, and continued in February 2016 when then Prime Minister David Cameron announced the vote would be in June. The pound hit a temporary low in April 2016, amidst fears of a ‘no’ vote, before rallying as market optimism in the outcome grew. But that optimism turned around at the end of May 2016, and the fall in the value of sterling continued as the market absorbed the news of the Brexit ‘yes’ vote on 24 June. A steady fall in the value of the pound continued until the end of October 2016, when it hit €1.1093. It improved again in the December to €1.1944, as confidence rose at the prospect of a good Brexit outcome, but the pound fell again in January as market pessimism increased – and the pound kept on falling. The pound weakened further as speculation spread that Article 50 would be triggered to start the Brexit negotiations – and it continued falling when the announcement was made. The pound hit a depth of €1.0802 in August last year, before strengthening to €1.1375 the following month. Since then amidst the political drama of Brexit it has kept chugging along on a weak level, varying between a low of just over €1.11 and a high just above €1.15. Even the Bank of England increasing the base rate from 0.5% to 0.75% in August this year did not boost the pound’s value – though arguably it prevented it from falling further. Anxiety about a no-deal Brexit and fear of a consequent sustained recession has held the pound’s value down – so a negotiated settlement could lead to an increase in sterling’s market value. At the time of writing a pound bought just over €1.12. Sterling’s fall against the dollar has been more pronounced than its fall against the euro. Peak to trough, sterling against euro, in the last five years has been €1.44 in July 2015 to €1.08 in August 2017 – a fall of 25%. In comparison, the pound’s peak in recent times with the dollar was in July 2014, at $1.7159, which fell to a low of $1.2167 in March this year – a fall of 29%. This stronger fall in the value of sterling against the dollar reflects not just concerns about the impact of Brexit, but also the strength of the US economy – bolstered by tax cuts which led to significant levels of US corporate profits being repatriated to the US. The weak sterling is impacting on cross border workers who get paid in sterling but live in the Republic and pay for goods and services in euros. Mortgage brokers say that it is now very difficult for a cross border worker to obtain a mortgage. Factors include Brexit, the fall in the value of sterling and the impact of the EU’s Mortgage Credit Directive. A Donegal advisor was also negative about the prospects for obtaining a cross border mortgage. “It is impossible, for various reasons,” she said, referencing in particular the EU directive. Theoretically, a weaker pound should lead to higher exports through more competitive prices. But there is little evidence of this in Northern Ireland’s economic figures, which indicate modest growth over the last year of around 1.6%. Some employers report their competitiveness has instead been hampered by recruitment problems, with more than a quarter of EU26 (non-UK, non-RoI) workers leaving Northern Ireland in the first year after Brexit as previously reported by The Detail. This is in part the result of uncertainty over their right to live in the UK after Brexit. But the weak sterling is a serious difficulty for employers in recruiting and retaining staff. Dr Owen Sims, senior policy advisor for the CBI in Northern Ireland, explained: “There is a tightening up of economies across the EU, including Poland and other countries we have a supply of migrant labour from, and really they [migrant workers] are seeing that their real wages – they make money in Northern Ireland and send portions of it home – their real wages are really falling, compared to the euro and where they could otherwise find employment. On November 19 following the fall-out from the publication of the UK EU Withdrawal Agreement including the resignation of Brexit Secretary Dominic Raab, the risk of a Conservative Party leadership election and fears of a no deal, it had fallen further to €1.1238. The risks were outlined yesterday ahead of next month’s parliamentary vote, after the Bank of England warned that the pound would crash in the event of a no-deal Brexit. In its analysis the central bank said that a worst-case scenario — disorderly exit — could cause the pound to drop 25%. All eyes will now be on the Brexit vote in the House of Commons on December 11.